The Crochet Hook - A Wonderful Thing! First of all let's talk about size...because in crochet...size REALLY matters! Hook sizes in the US are usually denoted by letters and numbers, for example H/8. But they usually are also marked with the European or metric size in milimeters (mm). So, the US H/8, is also the European size 5.00mm. Confusing, eh? Anyway, lets talk about the smallest to the largest sizes. Note - all crochet hooks are not made equal. What do I mean? Well, even different brands can vary slightly in size (and I mean only very slightly). But, that variation may mean the difference between you getting gauge for the pattern you love, or not. The smallest hooks are steel hooks. They go from size...Metric - 0.75mm/ US - #14 (smallest) to Metric 3.50mm/ US 00 (largest - there is no UK size eqivalent for these). 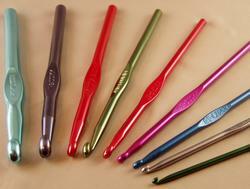 Steel crochet hooks are used for thread crochet and very fine yarns (lace weight or cobweb yarns). They are also used extensively for bead crochet. The heads of the finest hook scan fit through teeny seed beads! Below you will find a table of steel hook sizes. Next comes what I call "yarn size" hooks. You can find the more common sizes in plastic, but usually you'll find them in aluminum. These sizes range from Metric - 2.00mm/UK 14 (no US size equivalent), to Metric 19.00mm/ US S (No UK size equivalent). These hooks are used for yarns ranging from cobweb/lace weight at the fine end of the scale right up to 3 or 4 strands of worsted held together for the largest size. Now that project would be done in no time! Beginners may prefer to start off with plastic hooks, available in general craft stores. (The larger sizes are only available in plastic as their aluminum counterpart would be way too heavy to work with). Plastic is fine to start off with, but you may find your plastic hook to be slightly rough and catch on your yarn - not ideal. This becomes frustrating, and you may like to check out the next level - aluminum. 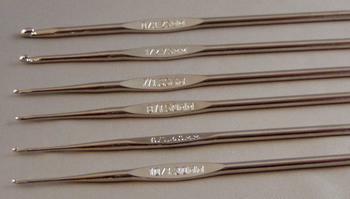 There are many metal crochet hooks around - the most popular being Boye (Wright's) and Susan Bates. These hooks are also widely available in craft stores other discount stores. If you really get into hooks, then you may wish to try other styles of hook. Crochet has come a long way in it's time and whereas hooks were made in bone, and ivory you can now also find handmade hooks formed from beautiful woods, like those made by Laurel Hill. For those who suffer from Arthritis, you can find crochet hooks made with ergonomic grips. These specially formed hooks have a fatter handle making them easier to hold for long periods with reduced fatigue to the hands. Now, just to get you really confused...you can also get crochet hooks which have a hook on one end and what looks like the end of a knitting needle on the other. This is an "afghan" or "tunisian" hook. In this method of crochet the loops are picked up along the row, then "knitted" off on the way back. But, you can also get hooks with hooks on both ends! Yes - they are for what's called "cro-hooking", "cro-knit" or more recently "crochet-on-the-double". This is similar to "tunisian", whereby you pick up loops and knit them off, but you can crochet 2 colors and have a reversible fabric with onc color more dominant on one side and the other more dominant on the other side. Fascinating, don't you think? And as if that wasn't enough - did you know you can also find square hooks? Yes, they say they're more comfortable to use than the rounded ones. I can believe that, as one of my frustrations is having the hook spin in my hand as I work. Whereas with a square one I could have my thumb in place and it wouldn't spin. I think I'll have to try some of these myself! Bet you didn't know you had such a vast choice of hooks at your disposal! Now to treat yourself...go on...you deserve it!